Beats X, AirPods, or PowerBeats 3: Which in-ear wireless headphones should you buy? If you want one of Apple's new W1-equipped in-ear headphones, here's the one you should pick up. Updated February 2017: Updated with a full writeup comparison of the three in-ear W1 headphones, including the Beats X.
Apple has now updated its entire wireless headphone line to take advantage of the company's new W1 chip: It simplifies the pairing process between your iPhone, Mac, and your headphones, automatically connecting to your devices when powered up. As a longtime Bluetooth headphones user, I love the simplicity of the W1-chip headphones. Pairing is a snap once you initially connect the headphones to your iPhone, thanks to the iCloud sync technology, and lag is almost always nonexistent. Now that Apple has several in-ear options on the market, however, it's time to pick which one makes the most sense for me (and you). Which one is best for your needs and wallet? Read on. Apple's three headphone offerings — its AirPods along with the Beats-branded Beats X and PowerBeats 3 — are separated by a maximum of just $50, but each headphone's feature set ranges depending on your needs. If you need a great wireless option for everyday use, it's hard to say no to Apple's AirPods. They have the best overall battery life of the three W1 headphones thanks to their rechargeable case, and the best features (Auto Pause and beam-forming Siri mics). There's also something to be said for their overall convenience — they pack smallest of the three options, and the lack of wires keep you from a detangling mess before rocking out to your music. Bottom line: For the best overall listening experience, pick up the AirPods. One more thing: The AirPods are perhaps the worst of the three for noise cancellation — if you need a set of earbuds to drown out outside noise, consider the Beats X or PowerBeats. Apple's AirPods are as popular as they are controversial: If you want a set of these buds, be prepared to wait up to six weeks for them to ship — or you can try to snipe one at an Apple Store after a restock. But because of their limited availability to try out, there have been major concerns about the AirPods's fit: Unlike the Beats X and PowerBeats, the AirPods ship only with their default earbud configuration — there are no silicone sleeves or earwings you can use to augment their fit. They also only currently ship in white — sadly, you can't get black AirPods to go along with your black iPhone. Their wireless nature also makes for a great charging and interactive experience: Each bud sports a 5 hour battery life, but as you get toward the end of that charge, you can pop a single bud back into the rechargeable case to get three more hours in just 15 minutes — all while continuing to groove out to your music in the other bud. When you're finished charging the one bud, just swap them out in the charger. The case supports up to 24 hours of extra charge on top of the initial five hours — enough to get through any lengthy flight, conference, or other activity. I also love the freedom of offering a friend an earbud if you want to invite them into your music or movie party (though I might use an antibacterial wipe first). 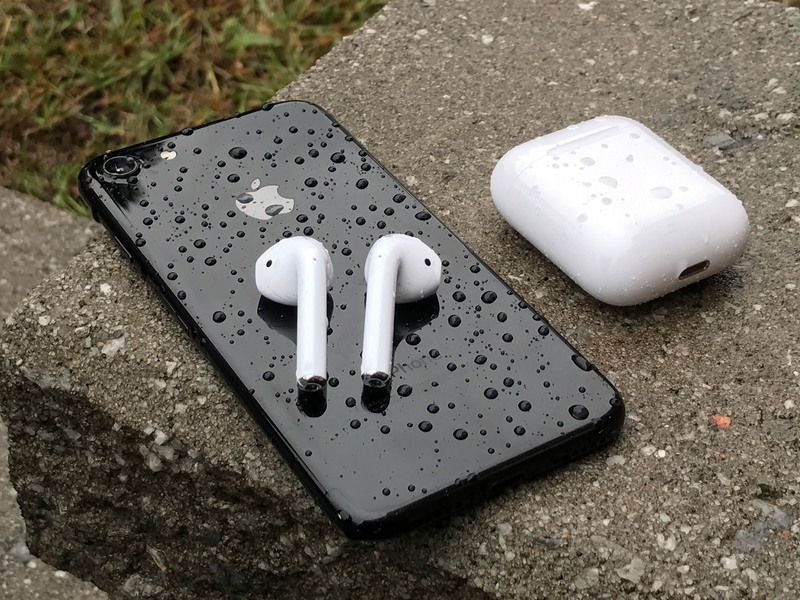 Unlike the PowerBeats 3, the AirPods aren't water- and sweat-resistant. But unless you find yourself regularly shorting out regular headphones while you work out, you shouldn't have anything to worry about when exercising with the AirPods: I've taken them skating and weight lifting, subjected them to rainy runs and high-intensity burpees, and walked through a snowstorm — all with no adverse effects. This is all personal experience, of course; your mileage may vary depending on your exercise routine, and there's a reason why Apple doesn't advertise the AirPods as water-resistant. But for most everyday workouts and activities, you should be fine. The other big win for the AirPods is their Apple-specific features. Every Beats and Apple wireless headphone now has the W1 chip, making pairing easier, but only the AirPods offer Auto Pause when you remove an earbud, and that same accelerometer technology lets the AirPods automatically connect when you remove them from their case — both the Beats X and PowerBeats 3 require you to press a button before they'll connect. The AirPods aren't perfect: They are dramatically less effective at sealing you inside a music bubble and drowning out surrounding noise than both the Beats X and PowerBeats because of their fit. Depending on your ear shape, this may be a minor problem or a major one, but either way, I wouldn't recommend the AirPods as an airplane companion. I'd also love some sort of fit adjustment in future models. Because you're limited to one earbud shape, the AirPods can never be the perfect headphone for everyone — and though I've seen them fall out of very few ears, giving their user a perfect sound experience is a harder bar to clear. But if your ears work with the AirPods, they're the best everyday carry wireless headphones on the market right now — if you can actually snag a pair. Apple's newest — and cheapest — wireless W1 headphones are the best option for users who need a more customized fit for their everyday earbuds and don't mind a wired connection. 8 hours of battery life should be more than enough for most daily use, and just five minutes of charge will give you an additional two hours of play. Bottom line: If you need more noise cancellation and a more customized fit, check out the Beats X. Though none of Apple's W1 headphone options have official noise-cancellation technology, the Beats X come closest to making noise cancellation a reality: Their super-customized silicone earbuds offer a variety of fits for small and big ears alike, and additional wingtip customization makes for a snug experience no matter your ear shape. Both the Beats X and the PowerBeats have a more concentrated sound than the AirPods because of this fit: You'll hear a stronger (but not overpowering) bass line, while the highs and mids have a more tinny, direct push. Podcasts and voices in videos come across clearly and crisply, with no major distortion. The downsides to the Beats X are mostly individual preference: The Beats X have a rather lengthy neck cord and two "weights" (which — spoiler — probably have tiny lithium-ion batteries in them), which sport the On/Off button and Lightning port, respectively. In daily use, this cord is fairly comfortable and not too distracting to wear, but exercising can be far less enjoyable due to the cord's microphonics: If you bump the cable against your shirt or other object, you can get an annoying rustle that can distract from your music, podcasts, or other daily activity. You also have to be careful about how you put on the headphones: If the cord gets twisted, the Beats X can easily pop out of your ears as you move your head or body. The cord's built-in remote and mic provide for easy volume controls, but the Siri and phone call experience isn't quite as good as the AirPods — Siri would frequently mishear words during dictation, and my callers told me the conversation wasn't as crisp as prior (AirPods-equipped) conversations. Apple's only official sweat- and water-resistant W1 headphones are the only choice for those who have shorted out regular headphones in the past: Their 12 hour battery life should be more than enough for even the hardiest adventurers, though their bulk can occasionally get distracting. Bottom line: Need a heavy-duty set of in-ear exercise headphones with the W1 chip? Get the PowerBeats 3. I use my AirPods almost every day when I exercise, but if I was heading out for a marathon or a sweat-inducing workout, I'd take the PowerBeats 3: These Beats-themed headphones are primarily marketed for heavy-duty exercise users, and they hold up. I've taken the PowerBeats 3 through power yoga sessions and cardio murder hours and they've held up like champs, streaming music and keeping my head in the game — even if my body is steaming like a sauna. The PowerBeats 3 feature an adjustable neck cord to keep the microphonics (rustling cord) effect from bothering you during exercise, and ear hooks to lock your earbuds in place during the fiercest of workouts. Both of these features work as advertised, though I personally hate ear hooks — I find them more distracting (due to how they push on the back of my ears) than helpful when I work out. The PowerBeats feel bulky in the hand, but the headphones' large size does somewhat disappear as you fall into the exercise groove. They might look a little silly to outside users, but they do their job. I do personally have a problem with using them while I skate, as they won't fit under my helmet — if I'm doing skating warmups, I'll take my AirPods any day. Though the Beats X and PowerBeats are great headphone picks for specific uses, the AirPods remain the top overall in-ear W1 headphones for me and, I'd wager, most people. They sound great for their minuscule package, get fantastic battery life, and work in just about any situation outside of an airplane or heavy-duty exercise session.